Madden again? EA Sports, indeed. A strong delivery from EA, really kicked E3 up a notch by hitting us with a multitude of games - something I felt was lacking in the Microsoft conference, instead opting to give us more Kinect nonsense. Honestly who actually uses voice commands over the controller? That's a unique brand of laziness. The biggest news about this iteration is Co-Operative play. Cue Adam Jensen: I never asked for this. I guess the developers felt that this was a good way to step up the level of the game. However in doing this I feel that they completely remove the fear element from the self acclaimed "survival horror". Going the way of Resident Evil in their fifth game, they have added co-op and stripped their game of any last shreds of horror they might hope to induce and replaced it with the chatter of microphone banter. Horror is important to my survival horror games, saving ammo, being gripped by terror as you walk around lonely environments with death waiting behind every door and lurking in all shadows. 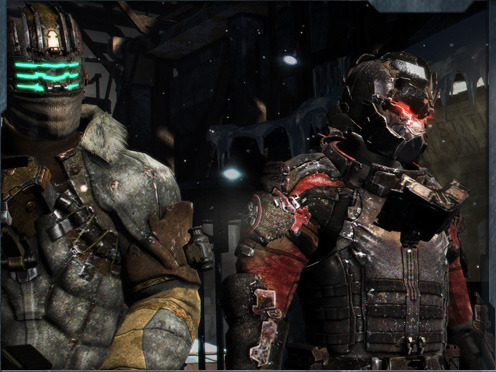 Dead Space was always a different breed, armed to the teeth you never really felt as if you were a vulnerable loner with only a popgun to defend yourself - more of a military tank in a nightmare world. Hopefully my fears for the game being cheapened because of co-op are unfounded but I can't shake the feeling that we've been here before with the Resident Evil franchise, the shock going from the excellent RE4 to the not-so-great RE5. I put my faith in your direction, Visceral Games! Roll on Feb 2013. I understand their desperation, 'please, don't leave our game' because I struggled with this game myself. I really wanted to like it. I played a full month of it and it ended up as nothing more than a WoW 2.0. Disappointed, I still made it to the max level with a Smuggler and messed around in PvP a little, but ultimately found nothing to keep me there - not even a new character. Even with their latest free-till-Level-15 deal I won't be going back - not until a big expansion I suspect. One of the more pretentious FPS games, which I only mention because it has the stigma of being the game of "the PC Master Race" and only played to the full potential by those with the meatiest gaming rigs. Politics aside, the game looks great simply from a gameplay standpoint, pretty sure I saw them take out a chopper with a bow. I'm sold. - Sim City Facebook: I will unashamedly play it and I'll enjoy it. Even if I have to invite 50 friends to level up. - Shooty McShooter The Game AKA Medal Of Honor: Warfighter. All these FPS games are blurring into one for me, I'm really finding it hard to distinguish them, which is a terrible thing to say to Medal of Honor since it's one of the more long running games. Appearing on the scene many years before today's giant: Call of Duty.